QUIKRETE® Concrete Resurfacer provides an economical alternative to removing and replacing existing old, spalled concrete. QUIKRETE® Concrete Resurfacer provides a beautiful, durable, wear resistant surface designed to withstand heavy foot and vehicle traffic. The Easy Way to Make Old Concrete Look New! Do-it-yourselfers and contractors can use QUIKRETE® Concrete Resurfacer for large applications such as driveways, walkways, sidewalks and patios. Pre-wash the surface with a high-strength pressure washer. 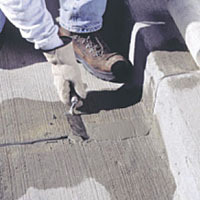 Old concrete must be rigorously cleaned to ensure proper adhesion of QUIKRETE® Concrete Resurfacer to the old surface. 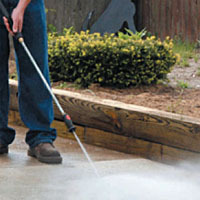 A high strength pressure washer must also be used to completely clean the existing concrete. Section off the work into areas no larger than about 144 sq. ft. (13.4 M2). Control joints and expansion joints can usually be used to define work areas. It is essential that control joints and expansion joints are maintained. Use weather stripping or duct tape to prevent QUIKRETE® Concrete Resurfacer from spilling into joints. Mask areas that are not to be coated with QUIKRETE® Concrete Resurfacer. 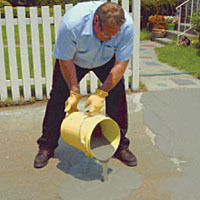 QUIKRETE® Concrete Resurfacer must first be used to repair any cracks that might be present in the existing concrete. Level spalled areas and pits with QUIKRETE® Concrete Resurfacer in trowelable consistency. 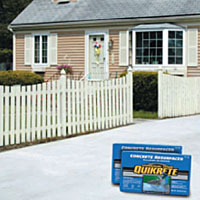 Use approximately one part water to 7 parts QUIKRETE® Concrete Resurfacer. Allow the repairs to harden before resurfacing the entire area. 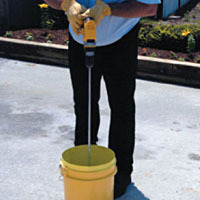 Mix QUIKRETE® Concrete Resurfacer in a five gallon bucket with a 1/2" paddle mixer and drill. A commercial mortar mixer can be used for large applications. Mix in a five-gallon (19 L) bucket with a 1/2" (12mm) drill and paddle mixer. Add the powder to the water and mix to a lump free pourable consistency. If mix is too thick, you may SPARINGLY add water to reach the desired consistency. The correct consistency is obtained when a 9 oz. (270 mL) drinking cup of resurfacer spreads to about 8-9" (200-230 mm) when poured on a flat non-absorptive surface. Larger quantities can be mixed using a mortar mixer. 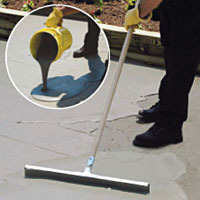 Pour the QUIKRETE® Concrete Resurfacer and simply apply the Concrete Resurfacer using a long handled squeegee. Saturate the surface with water then remove any standing water from low places. Next, simply pour then spread with a long handled squeegee. Use the squeegee to scrub the material into the surface. Finish off hard to reach corners and edges with a wall paper brush. Follow within five minutes with a brooming action. To give a professional appearance, be sure all broom strokes are the same direction.Make the brooming action a full stroke across the full distance of the current resurfacer work area without stopping. 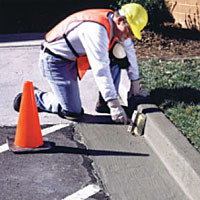 If desired, a concrete edger can be used around the edges within 20 minutes of pouring. Keep the leading edge of the edger slightly raised. Under normal conditions no special curing is required. Keep temperature above 50°F for 24 hours after finishing. 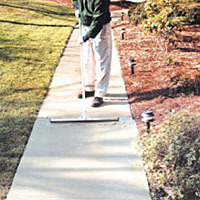 QUIKRETE® Concrete Resurfacer can be brush or broom finished for a professional look. 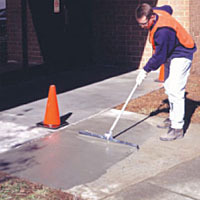 QUIKRETE® Concrete Resurfacer is applied with a long handled squeegee or a steel finishing trowel. For a variety of textures, a broom or masonry brush can be used. QUIKRETE® Concrete Resurfacer has a working time of about 20 minutes at 73°F (23°C). In hotter weather, working time will be reduced. QUIKRETE® Concrete Resurfacer is a special blend of Portland cement, sand, polymer modifiers and other additives designed to provide a shrinkage compensated repair material for making thin repairs to sound concrete which is in need of surface renewal. QUIKRETE® Concrete Resurfacer provides a beautiful, durable, wear resistant surface designed to withstand heavy foot and vehicle traffic. QUIKRETE® Concrete Resurfacer provides an economical alternative to removing and replacing existing old, spalled concrete. Wait 6 hours before allowing foot traffic and 24 hours for automobile traffic. With cool temperatures allow longer curing time prior to use. Protect from rain for at least 6 hours, longer in cool or damp weather. Do not cover unless immediate rain protection is necessary. No sealer is required. Do not apply at temperatures below 50°F (10°C). In cool weather use warm water approximately 120F, (50C) to speed setting time. In hot weather work in shaded areas or in the cool parts of the day, and use cold water to slow down the setting time. 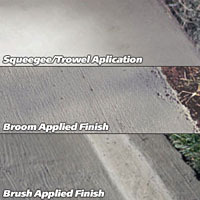 For thicker applications use additional thin layers of QUIKRETE® Concrete Resurfacer or use a trowel applied layer after the initial squeegee application. Use form boards and leveling screed to establish the final height. For trowel applied mixes reduce the water content to about 5.5 pts. (2.6 L) per bag.